This award is given to those who have helped shaped our state. 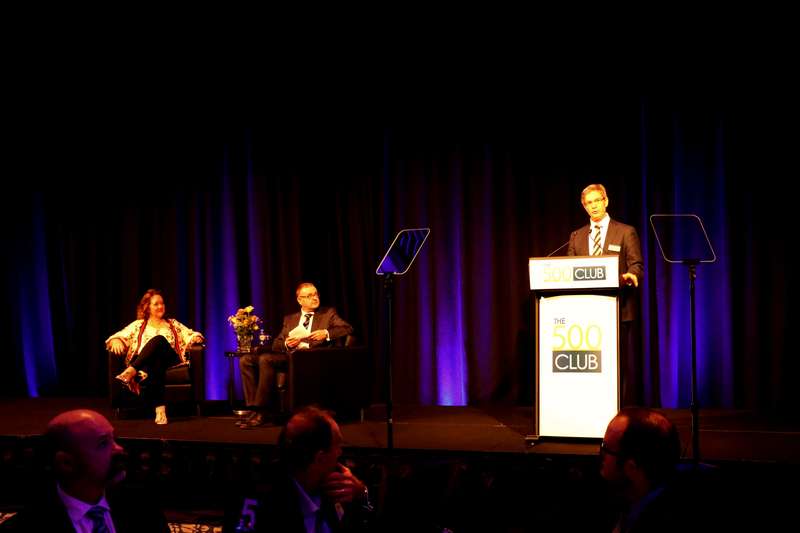 Mr. William Meston, when presenting the award said “It is an absolute honour and pleasure to be here today to introduce our inaugural keynote speaker for the 500 Club’s State Shapers series. 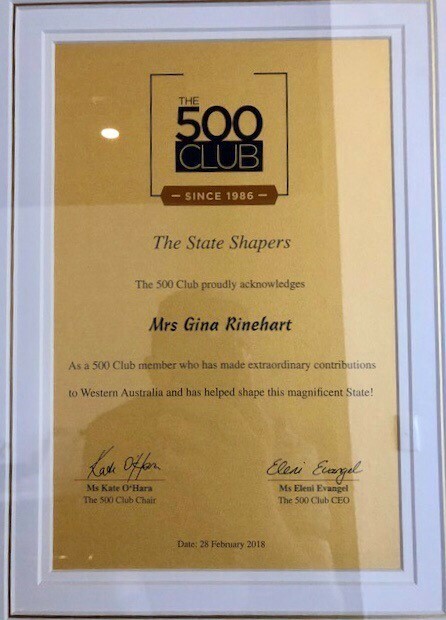 Most importantly, (Mrs Rinehart) has the courage of her convictions and the incredible levels of resilience required to succeed by doing things differently…Our inaugural state shaper is for me, someone that I have admired since I arrived in WA and someone who today, I have the privilege of introducing to you all. 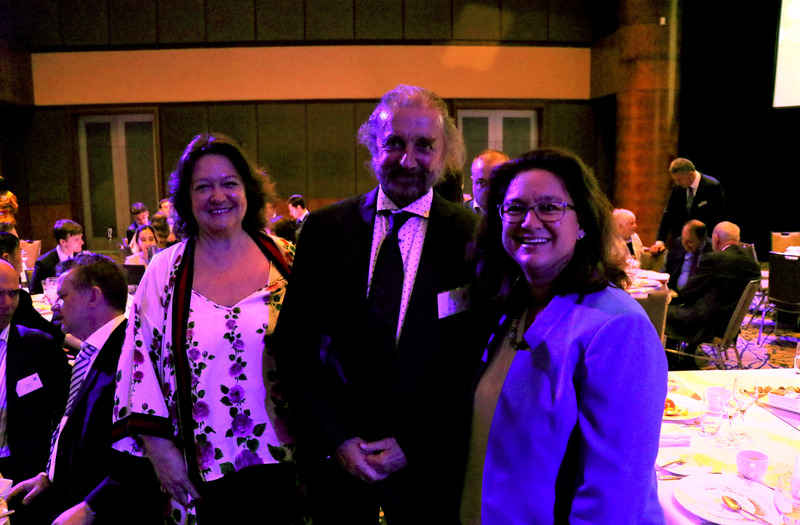 She has played a major role in shaping the state of Western Australia…She is Executive Chairman of Hancock Prospecting Group, Roy Hill and S. Kidman & Co. Gina Rinehart is a leading figure in the mining and agriculture industries in Australia. Since becoming Executive Chairman of the Hancock Prospecting Group in 1992, Mrs. Rinehart has transformed that Group from one that was in difficulty and financially troubled to a successful industry-leading innovator. At Hope Downs, Mrs Rinehart took the company’s tenements from a status of temporary titles – with the area having little more than a few drill holes – to a partnership with Rio Tinto, constructing three major mines. This involved an enormous approval process, extensive high-risk expenditure for both exploration and studies, then raising money to develop these mammoth mines and related facilities….Mrs Rinehart’s flagship achievement is the exploration, financing, construction and operation of the $US10 billion Roy Hill project – the debt raised was the largest ever for a mainly greenfield land-based mining and infrastructure project anywhere in the world. This debt-funding package was secured from 19 of the largest banks in the world and no less than five Export Credit Agencies. 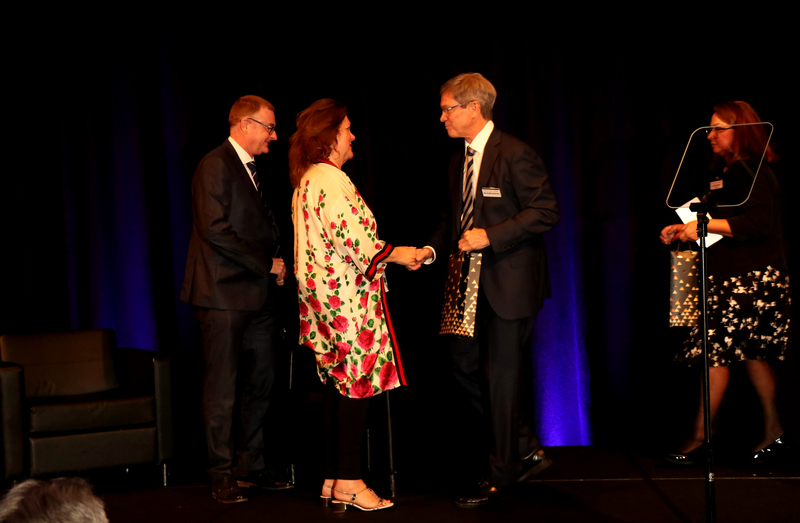 Mrs Rinehart’s business acumen and industry leadership has been recognised in her own country and internationally. She was awarded an Honorary Doctorate from Bond University, an Honorary Life Membership of the Institute of Public Affairs, she was named Telstra Australian Businesswoman of the Year in 2009, CEO Magazine Chairman of the Year 2014, which are in addition to the numerous lifetime achievement and other awards. She is founder of Australians for Northern Development and Economic Vision (ANDEV), has authored two books, is a regular feature writer, started Australia’s Annual National Mining and Related Industries Day and National Agriculture and Related Industries Day, and is Patron of several organisations. Mrs. Rinehart was awarded this award given her enormous contributions to our state, firstly in the mining sector and now increasingly in agriculture too. She also started Australia’s first national day for the mining and related industries, and last year , the inaugural day for the agriculture and related industries, 22nd and 21st November respectively, the two largest industry contributors to our state. Please see below Mrs. Rinehart’s speech and photos from the luncheon.